Book Review. Tenochtitlan 1519-1521 by Si Sheppard. I’ve been waiting ages for a campaign book on the conquest of Mexico. Si Sheppard sets out to do two things. First narrate a concise account of a three year drama and second to emphasise the contribution of the Spanish allied tribes, this is also convincingly done. Happily Sheppard does not speak of Aztecs, but of the Mexica and as far as he can he uses more indigenous spellings, such as the Mexica honorific, Malintzin as opposed to the more popular Spanish Malinche. A great controversy of the conquest is, ‘what was Moctezuma thinking!’ Was he indeed afraid that he was facing a divinity, or was he merely hopeless? Or is there another answer? This is not to book to investigate this, nevertheless it is at the heart of the campaign. Some feel that Moctezuma has been the victim of post conquest press, painting him as ineffectual. Sheppard, briefly flirts with the old idea that Moctezuma II could not at first rule out that there was something divine about the newcomers and acted indecisively. But the author observes later in the introduction that any suspicions the tlatoani had about the divinity of the strangers would have been dispelled after the massacre at Cholula, and demonstrates, though does not state, that Moctezuma was focused entirely on turning the invaders back and kept his options open until he met the Spanish. Sheppard avoids coming to a conclusion about Moctezuma in his assessment of the opposing commanders. He does lend himself somewhat to the idea that once Cortes got to Tenochtitlan he became indecisive and lays a great deal of blame for the Mexica disaster at Moctezuma’s feet. The issue with upholding the righteous cause of the triple alliance is that they become victims. And while it is undoubtedly right that the conquest be criticised, the Mexica became victims because they lost, not because they could not challenge the Spanish. The author attempts to arrive at a parity of ruthlessness and cruelty between Cortes and Moctezuma, and does not indulge in championing either the conquerors or the downtrodden, which would be a mistake in such a book, nonetheless he cannot avoid offering his sympathy to the Mexicans and his relative condemnation of the cruelty of the Spanish. Being primarily a military work, Cortes is given great credit for his leadership and skill as a commander and indeed as diplomat, as is Cuatemoc, who emerges as the most effective Mexica leader. All in all very little of the dark side of anyone’s personality surfaces in this book except in deed. In such a small book, I think, this is a fair enough discussion of the subject. Full and rightful credit for the success of the Spanish conquest is given to the commanders of the Tlaxcalan alliance, without whom, Cortes must certainly have failed and the people of Central America might have achieved a measure of self-determination away from Spanish interference. To some extent, Sheppard goes so far as to suggest the calamity was therefore not just a plague from Spain, but in a way a calamity of Mexico’s own making and as much as possible sketches an impartial picture of one empire battling against another, sympathising in sum with the defeated no more than he would with any nation. There are merits to this, as it removes the usual discussion about right and wrong, but sails dangerously close to ignoring the fact that unlike other conquests around the world, this one all but obliterated the culture of the government it overthrew. The theme of two rapacious empires locked in a death struggle continues through the opposing forces section. Great stress is placed on the minority of the Spaniards, estimating that only “one half of one percent” of the army besieging Tenochtitlan in 1521 was from Spain. Supporting the idea that the conquest was driven by Spain but not won by it. Instead the Spaniards with their small herd of horses, and small arsenal of guns which they could not shoot at the battle of Otumba due to a crippling lack of supplies, were dwarfed by the Quadrupal Tlaxcalan Alliance, and allied kingdoms all of whom shouldered the main burden of casualties and fighting. Sheppard hardly goes so far as to suggest the Spaniards in their steel armour could not outfight a Mexica warrior man to man, all of that is gone into quite thoroughly, but the author convincingly shows that they were quite aware that any campaign fought without native support was doomed. Rejecting the common idea that the Spanish vanquished the Mexica by dint of their technology, hard bitten prowess and fatalistic ideology. Indeed it is shown that the Spanish leaders were so aware of their dependence on their allies that they were at pains to cover up their contribution, which does both a disservice to the allied kingdoms and the Mexica themselves. Sheppard has also found no indication that the allied tribes felt in any way conquered by the Spanish, (until after the conquest) and that they acted as allies and Cortes treated them as such. So instead of supermen, superior in every way to the enemies they fought, save for their greed, many proofs are presented to show that the greatest Spanish contribution was impetuous and the incidental introduction of pathogens into Mexico. The danger here is that the approach of marginalising the Spanish is to suggest that they are not as culpable in the subsequent colonisation of Mexico. So while it provides a more mature version of how the conquest occurred, some of its assertions will be problematic. The Mexica, usually described as brave but outmatched are given a much more formidable aspect in this book. A fighting force that waged war differently but were quite acquainted with the idea of annihilating an enemy in the name of divine glory and the betterment of their leader’s power. The Mexica alliance are represented as using wars, flower wars, and economic sanctions on neighbours to wear them down. Tlaxcala was in this position when the Spanish came. 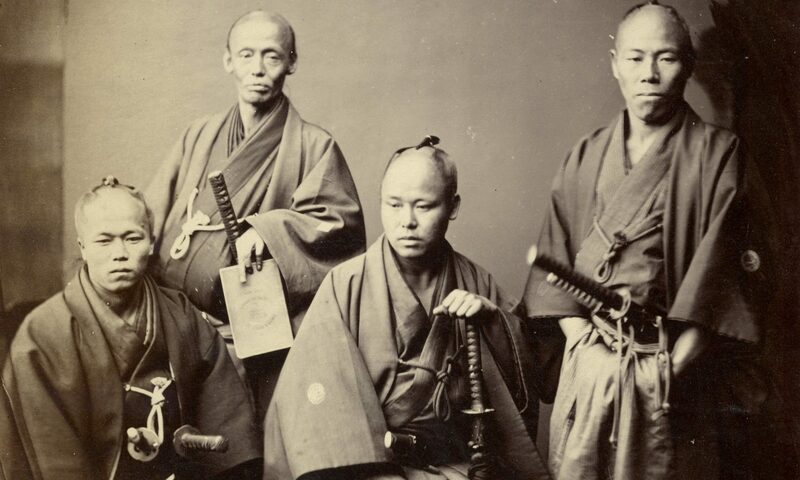 They are also shown as disciplined and highly organised fighters, for whom warfare was both the most natural and the easiest way to achieve social mobility. Once more an attempt has been made here to reorient common conceptions about the two sides. The book appraises the fighting with a cool impartiality, following the written accounts and always placing a great importance on the Spanish allies. The Mexica posited as at a disadvantage due to a lack of experienced officers. Highlighting the massacre of many of their leaders by Alverado as key in the subsequent lack of command and control. The Battle of Otumba is not covered in any detail. A half page description of one of Peter Dennis’ paintings suffices to give the broad outline of his epic clash. Interestingly it gives a cynical verdict about this Spanish victory. Arguing that the Mexica had to withdraw after their system of communication was ruptured allowing the Spanish to escape, logically labelling what is often called a great Spanish victory as an inconclusive and desperate delaying action. This ties into the author’s theory that the Mexica were under-officered after the massacre at the festival of Texcoco. Once more the Tlaxcalan alliance and the part played by he other states around the valley of Mexico is at the fore. Not as forced or unwilling vassals but full allies with a stake in the political future of the country, who dictate terms to Cortes, while other nations declare their neutrality and await the outcome. The Great siege of Tenochtitlan is portrayed as a relentless grinding nightmare of win and loss for both sides. Here actual Spanish fighting prowess is better highlited than in any other place in the campaign, but it was only allowed to be displayed because of massive native effort that accompanied it as, one by one, Cortes separated the Triple Aliance from its vassals and allies. Having done his best to strip back legend and sentimentality from his narrative, we are not shown monstrous conquerors or naive victims but two sides equally mature in their development and goals. And in that sense this is a very mature account that tries to focus mainly on the military course of events. 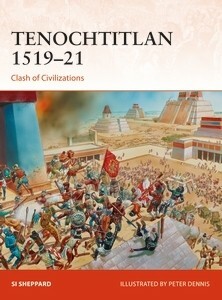 In his closing comments, Sheppard argues that the record of Mesoamerican civilisation suggests that Tenochtitlan would have eventually suffered the fate of Teotihuacan, and that even if Christians of a later less belligerent century arrived in Mexico their diseases would have done the work of conquest wether they liked it or not. This follows the trend of the book, which teeters very close at times to ignoring that this conflict did not lead merely to the change of governments but the evaporation of a civilisation. Three exciting colour plates form the bedrock of the illustrations. Peter Dennis has created images that show the core events of the fighting. All of which interestingly highlight the Spanish rather than their allies. Otumba sees the Spanish cavalry in action, the fighting in Tenochtitlan has the Spaniards storming the peak of a temple and the final siege shows the vital contribution of the Spanish ships. All of which are full of the artist’s usual verve and energy. At the heart of Sheppard’s narrative is the argument that the Spanish contributed a limited amount of technology and engineering knowledge, core political unification of intent, and most decisivly, pandemic levels of pathogens to the struggle, the old enemies of Tenochtitlan did the rest. And it is in this that an underapprecisted tragedy is revealed. Not the destruction of a city that even it’s destroyers believed to be a marvel, but the betrayal of the allies, who although involved for their own interests, nonetheless became some of the first in America to learn the hard way about how little the eastern newcomers cared about promises. Previous PostPrevious Book Review: Greek Hoplite vs Persian Warrior by Chris McNab. Next PostNext Book Review: Napoleon, Spirit of the Age by Michael Broers.